This month’s issue of the North Portslade Community Newspaper has a great article on the front page. The book can be purchased on Amazon.co.uk. Or order a signed copy by post. Send a cheque for £11.99 [I presume it will be more for overseas purchases] made payable to J Ryan, to “In and Out of the Lion’s Den” c/o 2 Fairfield Gardens, Portslade, Brighton, East Sussex, BN41 2BH, together with details of your name and address, and a copy signed by John Shepherd will be posted to you. Portslade has long been a favourite place for Brighton footballers and Sussex cricketers to live whilst they ply their trade in Brighton and Hove. For many it becomes their permanent home after their sporting careers have ended. One such resident is John Shepherd, who played football for the Albion back in the 1950s and has continued to live in Portslade ever since. John joined the Albion from Millwall in 1958 and was Brighton’s top goal scorer in their first ever season in Division Two in 1958/59. 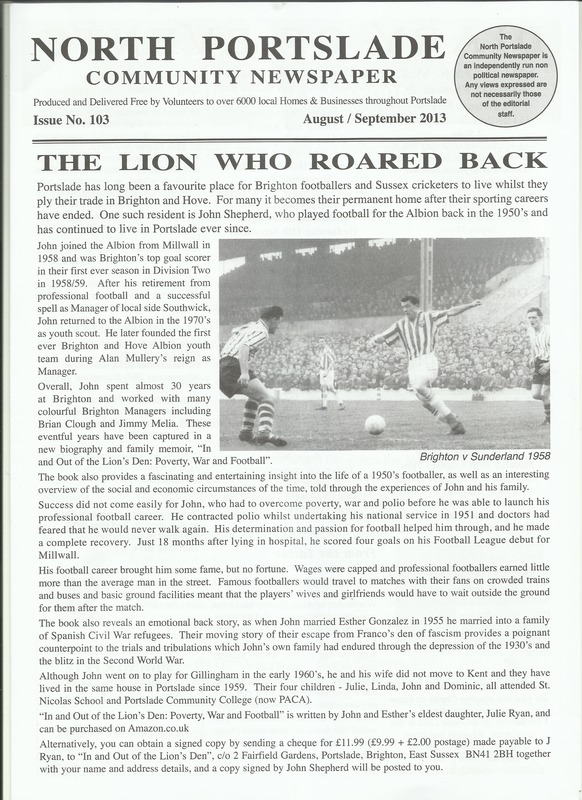 After his retirement from professional football and a successful spell as Manager of local side Southwick, John returned to the Albion in the 1970’s as youth scout. He later founded the first ever Brighton & Hove Albion youth team during Alan Mullery’s reign as Manager. Overall, John spent almost 30 years at Brighton and worked with many colourful Brighton Managers including Brian Clough and Jimmy Melia. These eventful years have been captured in a new biography and family memoir, “In and Out of the Lion’s Den: Poverty, War and Football”. The book also provides a fascinating and entertaining insight into the life of a 1950’s footballer, as well as an interesting overview of the social and economic circumstances of the time, told through the experiences of John and his family. Success did not come easily for John, who had to overcome poverty, war and polio before he was able to launch his professional football career. He contracted polio whist undertaking his national service in 1951 and doctors had feared that he would never walk again. His determination and passion for football helped him through, and he made a complete recovery. Just 18 months after lying in hospital, he scored four goals on his Football League debut for Millwall. His football career brought him some fame, but no fortune. Wages were capped and professional footballers earned little more than the average man in the street. Famous footballers would travel to matches with their fans on crowded trains and buses and basic ground facilities meant that the players’ wives and girlfriends would have to wait outside the ground for them after the match. The book also reveals an emotional back story, as when John married Esther Gonzalez in 1955 he married into a family of Spanish Civil War refugees. The moving story of their escape from Franco’s den of fascism provides a poignant counterpoint to the trials and tribulations which John’s own family had endured through the depression of the 1930’s and the blitz in the Second World War. Although John went on to play for Gillinhgam in the early 1960’s, he and his wife did not move to Kent and they have lived in the same house in Portslade since 1959. Their four children – Julie, Linda, John and Dominic, all attended St. Nicolas School and Portslade Community College (now PACA). Alternatively, you can obtain a signed copy by sending a cheque for £11.99 (£9.99 + £2.00 postage) [UK costs only, I assume] made payable to J Ryan, to “In and Out of the Lion’s Den”, c/o 2 Fairfield Gardens, Portslade, Brighton, East Sussex, BN41 2BH together with your name and address details, and a copy signed by John Shepherd will be posted to you. Hope you don’t mind, Jackie, but in this Tuesday’s guest post that I wrote for Judy at Greatest Generations, I included a link to your site. The article is about war time rationing and it seemed apropos.